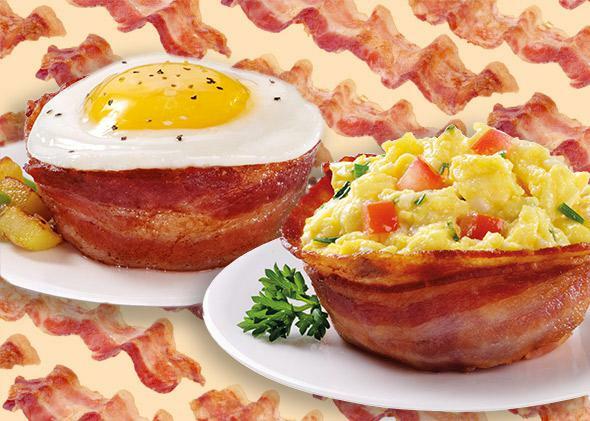 Perfect Bacon Bowl: Why the infomercial deserves a little more respect. The format thrives, but big companies are taking over. The Perfect Bacon Bowl makes everything taste better! Depending on who you ask, the infomercial industry could be worth anything from $200 billion, to $250 billion, or even $300 billion. Whatever the number, that’s pretty big. And as Jon Nathanson (now Slate columnist) pointed out in his exhaustive breakdown of the economics of infomercials on Priceonomics, in comparison, the U.S. network and cable industry was estimated at just $97 billion in 2013. So why isn’t Thom Jensen, the founder of the Perfect Bacon Bowl (which has shipped 2 million units since late 2013), getting the kind of adulatory coverage bestowed on Instagram, an app that was basically profitless when Facebook purchased it? It seems obvious—I mean, a bacon bowl? And the industry has long been associated with hucksters like Kevin Trudeau and questionable weight-loss gizmos such as the Neckline Slimmer. But consider the household brands that have emerged from late-night infomercials—Proactiv, OxiClean, and George Foreman Grills—and the fact that big names like Geico and Dove are just as likely to be making infomercials these days as ThighMistress Suzanne Somers. It makes you wonder—is there some kind of innovation snobbery at play? And to think it all started with a blender. It’s generally agreed that William “Papa” Barnard, the founder of Vita-Mix, made the first infomercial in 1949, when he demonstrated his product live on TV. In those days, inventors with limited funds and a revolutionary gadget to fix your gut/back/mold problem could buy cheap airtime in the hours no one else wanted. But the golden age began in 1984 when President Reagan deregulated the television industry, allowing broadcasters to sell larger chunks of time to advertisers. That year also saw a significant cable television growth spurt, exploding the number of channels needing content. In 1984–1995, marketers rediscovered the “the power of the half-hour,” and fortunes were made. It was also then that some of the biggest marketers succeeded with a business model that may still hold about an 80 percent share of the DRTV market: Find products created by a would-be Edison somewhere in America, market them on DRTV, give a small royalty cut to the inventor, and share the risk of a capricious DRTV audience across your product portfolio. The most successful of these marketers, Guthy-Renker, was founded in 1988. Bill Guthy and Greg Renker’s Justin Bieber–spruiked pimple cream, Proactiv, is ubiquitous, accounting for about half of their $1.8 billion annual sales. Another is Telebrands, the owner of the surprisingly popular Pocket Hose, which has sold more than 17 million units. DRTV firms have come and go, but Guthy-Renker and Telebrands have dominated the market for close to three decades, along with BeachBody (owners of Paul Ryan–approved workout, P90X), EuroPro, and a few others. But increasingly, prestige brands are getting into DRTV. While Time-Life may have been one of the first to try direct sales in the early ’90s, brands like Johnson & Johnson, which spent $22 million on its DRTV launch of Neutrogena SkinID in 2008, see value in the ad format once reserved for the Shake Weight. Hawthorne told me that major brands are attracted to DRTV because it introduces some accountability to their market testing. Creating ads with traditional DRTV features—celebrities, demonstrations, and most importantly, a call to action—allows you to measure sales before or after the spot runs, as well as how it impacts social media and search. I asked Hawthorne whether infomercials were more of a “heartland” product—the result of garage inventors outside big-city production zones. Although there’s nothing particularly geographic to it, he suggested that people creating DRTV products are different from math majors coming out of MIT and heading to Silicon Valley. Thom Jensen, the inventor of the Perfect Bacon Bowl, is a Salt Lake City research histologist who tinkers in his spare time. The idea came to him when he was making bacon turtles for his family. And, Jensen told me, he has 20 to 30 other ideas in his back pocket, so perhaps there’s another monster hit on the way. It’s hard not to scoff at some of the products you see pitched in infomercials—but the format deserves a little respect. In their heyday, infomercials were certainly an innovative, scrappy way of bringing a product to market. “It’s part of a recurring pattern—when you develop any new means of communicating with consumers, the people quickest off the block tend to be smaller entrepreneurs. In part because they’re more nimble, in part because other avenues are closed to them,” Amar Bhidé, a professor at Tufts University who has studied entrepreneurship, told me. The downside: Long-run, economy-wide prosperity is due to technological advances, Bhidé says. In the case of most DRTV products, when one novelty dies, another shows up, but there’s no technological advancement. OK, the PedEgg isn’t likely to transform the economy. Still, it’s a little sad that increasingly low odds of success and the growing cost of DRTV are shutting off infomercials to anyone other than the leading DRTV marketers and major brands. Besides, what will BuzzFeed make GIF lists about now? But is this shift cutting off the spigot of American invention? Is the pathway to Snuggie success completely gutted? Perhaps not. Sites like Kickstarter and Etsy may in many ways be the heirs of DRTV. Look over the crowdfunder and online marketplace and it’s easy to see a direct line from gadget-hawking infomercials. In fact, many of Kickstarter’s pitch videos use the same proven infomercial strategies that may have enticed you to buy the Booty Pop: Demonstrate a problem, back it up with facts and figures, create an illusion of scarcity, and have a clear call to action. Not to mention Edison Nation, a Web platform that helps inventors submit ideas in response to company product searches, and even As Seen on TV’s own crowdfunding site. New brands that may have once advertised in the darkest hours of the morning are now able to market themselves online, thanks to these sites, and Hawthorne assures me that the big guys, like Guthy-Renker and Telebrands, are trawling the Internet looking for the next Bowflex. So, the dream may not be over for those that lie awake, thinking of Slim Suits. But act now—supplies may not last.